Updated: June 7th 2012: Cause for the issues found! Unsupported scenario having TFS 11 Beta side-by-side. Uninstall TFS 11 Beta before or even after install of VS 2012 RC. 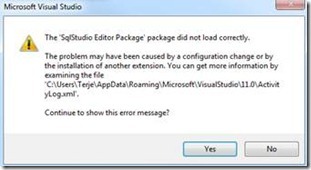 The Visual Studio RC has shown some install issues in some cases, particularly for those who upgrades from VS 11 Beta. These issues are caused by also having TFS 11 Beta server installed on the same machine. This is not a supported scenario. What is good is that if you forget to uninstall TFS Beta 11 first, and get these issues, all that is required is to uninstall TFS 11 Beta, and VS 2012 RC will start working correctly! I have listed the symptoms known now below, and will update if there are more issues. Note that a repair will not fix the issue, and a Windows restore and subsequent reinstall may not fix it either. The fixes below however, cures these issues, but you don’t have to do these now, just uninstall TFS 11 beta! This forum post is about the same issues. When you start up VS 2012 RC you get a loading error message. The same happens if you try to go from the menu to SQL/Transact-SQL Editor/New Query. 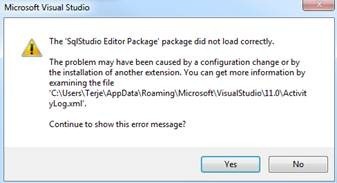 The ‘SqlStudio Editor Package’ package did not load correctly, or The ‘SqlStudio Profile Package’ package did not load correctly, or The ‘Microsoft.VisualStudio.Data.Tools.SqlLanguageServices.Package’ did not load correctly. You might even get all of these. The ones with version numbers ending in 55 is from the SQL 2012 RC, the ones ending in 60 is from the SQL 2012 RTM. There are two of each, one for x32 and one for x64. Which is which no one knows. 3. Right click each of them, and select Repair. You get errors referring to some extension that can’t be loaded, or can’t be found. Check the activity log (see below), and verify there. If you see yellow collision warnings there, the fix here should solve those too. This starts up Visual Studio. 4. Double click the file named ActivityLog.xml. It will start up in your browser, and be formatted using the xslt in the same directory. 5. Look for items marked in red. Great Post - thanks for the effort...I have made sure all these issue are in our feedback reports! I'm getting all 3 of the SQL Server errors. I only have the .60 versions of the "Data-Tier App Framework" installed. Repairing both of them seems to have fixed the error message. So envdev.exe fires up and crashes. 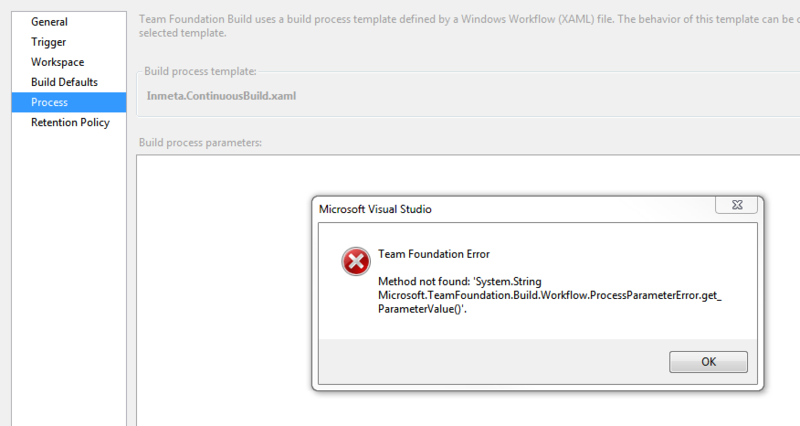 Following instructions to review ActivityLog.xml, there are red items such as ERROR "CreateInstance failed for package [Microsoft.VisualStudio.TeamFoundation.PowerTools.TfptPackage, Microsoft.VisualStudio.TeamFoundation.PowerTools, Version=10.0.0.0, Culture=neutral, PublicKeyToken=b03f5f7f11d50a3a]"
My question is: can I run regedit and disable this item? If not, Is there a config file that I can access to disable this item? What is the best way to disable all items that are ERRORing in the ActivityLog.xml file. I should point out that yesterday I upgraded one of the *.vsix files yesterday and all my problems began straight after that. I would like to regress this upgrade but cant because devenv crashes every time it powers up. The tfpt Power Tools can be removed from the Add/Remove programs. They consists of multiple extensions, so deinstalling is easier. To remove a single extension (vsix) you can remove the files from their install directories, or even just temporary rename the parent folder to disable all of them. You have a bunch at %LocalAppData%\Microsoft\VisualStudio\10.0\Extensions and another bunch at <VsInstallRootFolder>\Common7\IDE\Extensions. Some extensions may be installed to a folder given by its registry key. You could try to disable the extension, using the registry keys at HKEY_CURRENT_USER\Software\Microsoft\VisualStudio\10.0\ExtensionManager\EnabledExtensions.